WASHINGTON -- After months of preliminary skirmishes and hundreds of U.S. airstrikes, conditions are now right for Iraq to launch a decisive assault on Ramadi and reclaim the provincial capital from Islamic State fighters, a U.S. military official said Tuesday. 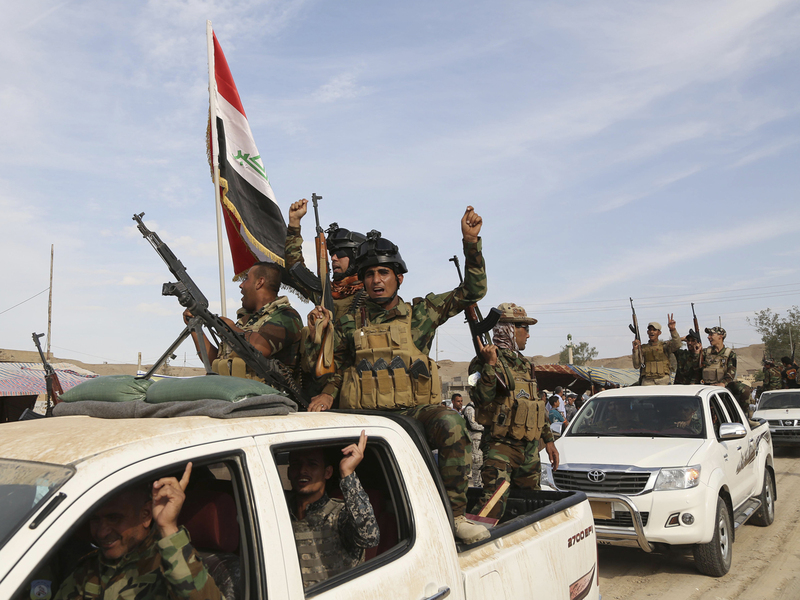 Army Col. Steve Warren, a spokesman in Baghdad for the U.S.-led coalition that is fighting the Islamic State in Iraq and Syria, said Iraqi ground forces have advanced about nine miles in recent days and are in the city's outer suburbs. He said Iraqi F-16 fighter jets have recently joined the battle in support of Iraqi ground forces. "Iraqi ground forces recently trained by the (U.S.-led) coalition have been deployed around Ramadi in time for the decisive phase of this operation," Warren said, referring to a counteroffensive that the Iraqi government announced in July. It has been stalled for numerous reasons, including the Islamic State's effective use of improvised land mines. The counteroffensive also has been weakened by sectarian divisions within the Iraqi government. "We now believe that battlefield conditions are set for the ISF to push into the city," Warren added, using an acronym for Iraqi Security Forces, which collapsed in Ramadi in May, allowing the Islamic State group to capture the Sunni city. Ramadi is the capital of Anbar province. The loss of Ramadi was the most damaging Iraqi setback this year against the Islamic State, which in 2014 captured the northern city of Mosul and still controls much of northern and western Iraq despite more than a year of U.S. airstrikes. U.S. Defense Secretary Ash Carter said after the Ramadi loss that it showed the Iraqi army had "no will to fight." Since then the U.S. has stepped up its training of Iraqi forces and encouraged the Iraqi government to make a push into Ramadi. Warren said the U.S. has intensified its airstrikes in the Ramadi area, launching 52 strikes over the past 10 days. He said the U.S. has conducted 292 airstrikes around Ramadi since the slow-moving counteroffensive began in July, and that these killed "hundreds" of Islamic State fighters. He said an estimated 600 to 1,000 ISIS fighters are now in Ramadi. The spokesman said IS fighters have developed a strong defensive system in and around Ramadi, including a creative use of improvised explosive devices to plant what amount to mine fields around the city. This is among the obstacles that slowed the advance by Iraqi soldiers over the summer. In recent days, Iraqi ground forces, including a contingent of Iraqi counterterrorism troops, have "essentially encircled the city," and are "squeezing in" from four directions, Warren said. He did not cite numbers, but others have said the Iraqis have about 10,000 troops committed to the battle. Ramadi is not the only important test facing Iraqi forces. They have been involved in a months-long struggled to recapture Beiji, in central Iraq, and a major oil refinery complex nearby. Prime Minister Haider al-Abadi announced on Monday night the second phase of a large-scale military campaign to drive IS militants out of that area. More broadly, Warren said the U.S. anti-Islamic State campaign is making headway with airstrikes that have thinned the ranks of the group's leaders in Iraq and Syria. He said approximately 70 senior and mid-level IS leaders have been killed in U.S.-led coalition airstrikes since May, or one every two days. In the last two months, he said, airstrikes near Mosul killed eight of the Islamic State's top leaders there. "We assess that this pressure creates paranoia, causes the enemy to continually reevaluate their security," he said. "In the days following a leadership strike, what we see is that ISIL (the Islamic State) routinely conducts searches of their own fighters, their own officials." Even so, U.S. intelligence agencies estimate that the fight against the Islamic State is essentially at a stalemate in Iraq and Syria, although the conflict has taken on an important new dimension in recent weeks with the entry of Russian forces into Syria. Moscow says its airstrikes are aimed at the Islamic State, but Warren challenged that assertion, saying Russian strikes are mainly targeting rebels opposed to the Syrian government, not IS. "They've claimed publicly that they want to fight ISIL," Warren said. "In reality, these reckless, these indiscriminate, irresponsible airstrikes have had the effect and will have the effect only of prolonging the suffering of the Syrian people."